I don’t know if these are creepy or cool. Hopefully they fall in the latter category. 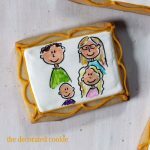 But these family portrait cookies are a perfect cookie gift idea for Mother’s Day, Father’s Day, or just because. 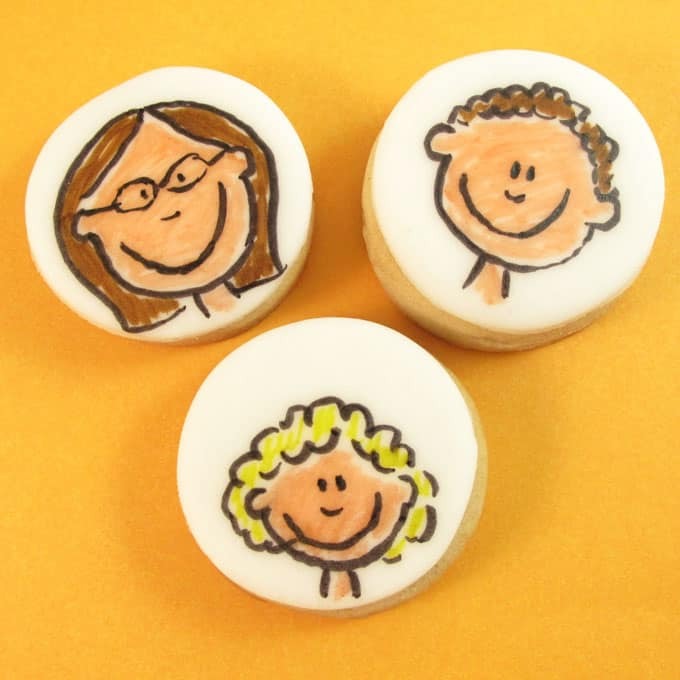 Draw on cookies with food coloring pens and personalize them to match any family. Or person. Or even pet. First, prepare cookie dough, chill it, roll it out, cut out your shapes, bake your cookies, and let them cool. 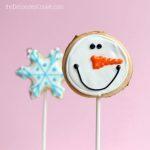 Prepare royal icing, tint it with white food coloring, and flood the cookies with the icing. 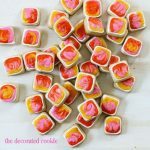 Alternatively, you can top the cookies with fondant, rolled out and cut out with the same circle cookie cutter. (For BASIC COOKIE DECORATING, click here.) Let the cookies dry totally, at least overnight, before drawing your designs with food coloring pens. 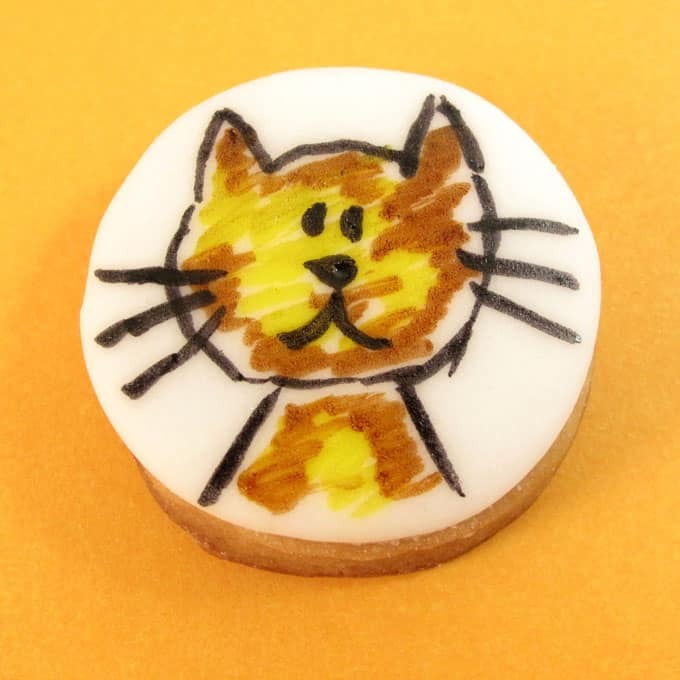 To draw on the cookies, I used Americolor Gourmet Writers. The skin tones available in edible markers are, ahem, limited. Americolor comes with a caucasian “flesh” tone, the light pink marker. 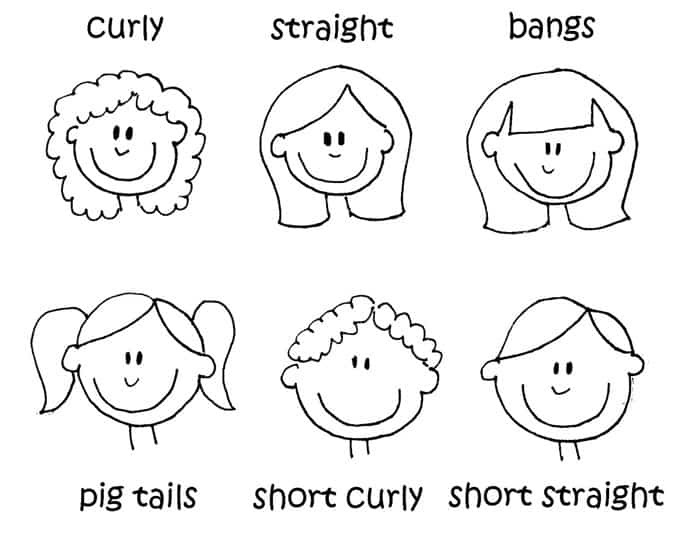 They only have on shade of brown, but you can vary the tone by sketching lightly or more heavily. I’m not sure how my head ended up so much bigger than my husband’s or daughter’s. Especially my daughter. For a 2-year old, she has a huge head. 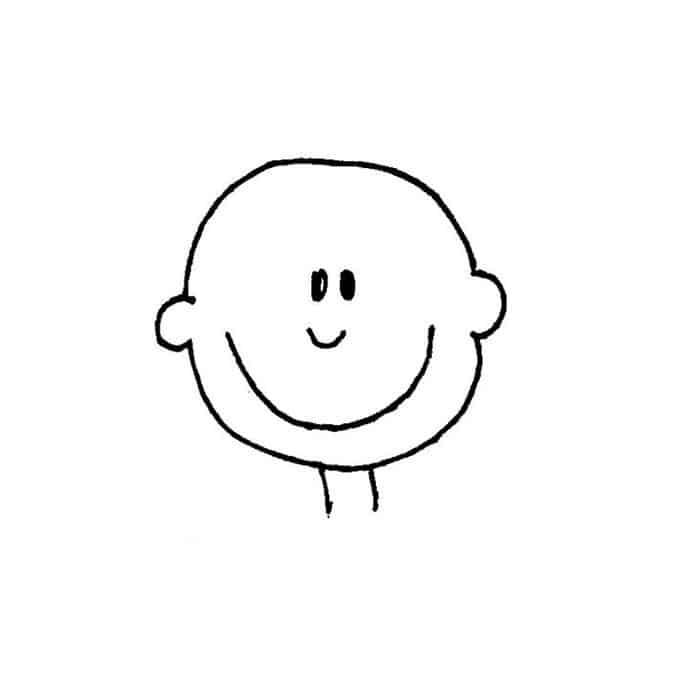 The basic portrait is simple: a round head, two ears centered on either side, the eyes are close together, slightly higher than the exact center of the circle, the wisp of a nose is in the center, and smiley is impossibly large. 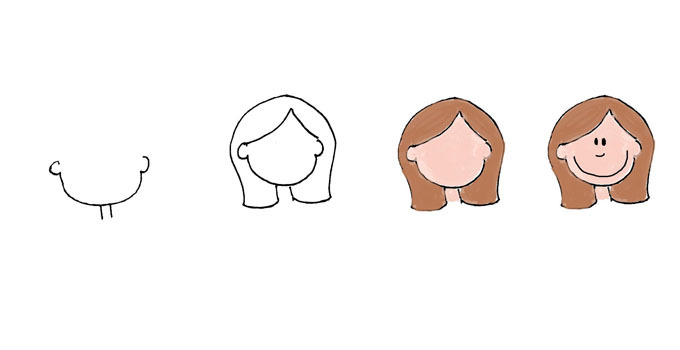 Draw the ears, draw a semicircle for the bottom half of the face, and draw two lines for the neck. Fill the hair, face, and neck. Draw the face on top. Draw mustaches, beards, and glasses last, on top of the finished drawing. Those are such a cute idea. 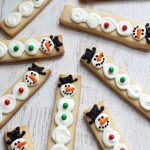 My family would love how cute these look. No these are not like creepy clowns; they're darling! Love it! What a great idea! THANK YOU. Great article, I'm gonna print it and keep it in mind. You way to draw everyone faces worth it. What a fun, personalized idea! Love it! Not like the creepy clowns at all, thank god. 🙂 Kinda cartoony, I like that! It's a good excuse to bite my husbands head off and medicate myself with sugar all at once. Darling! 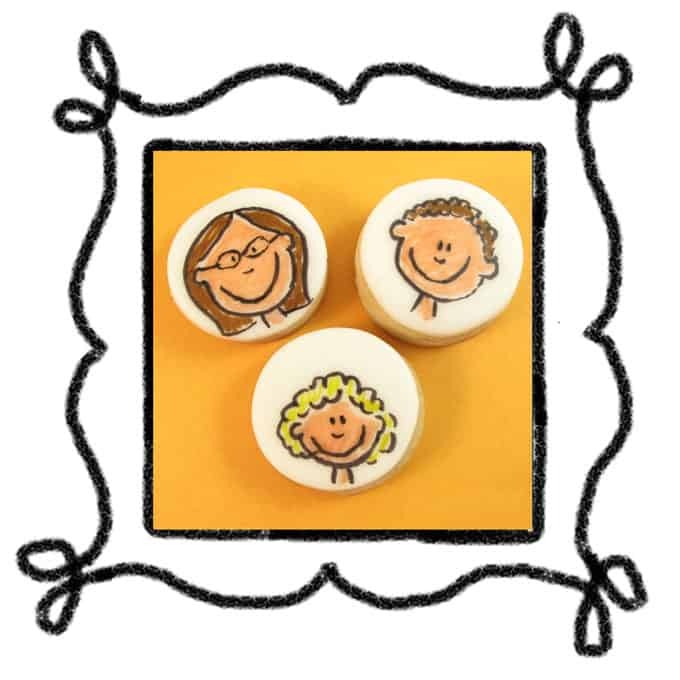 I've seen family tree cupcakes before, but I like these MUCH better! This would be so fun for a reunion! Oh my gosh, cookies and cups, too funny! Or sad? What to do when those with whom you share a house are too hungry to allow creativity to flow. Sigh. Aww! I love this idea. They are so, so cute! Thanks so much for the how-to, I'll be linking.